A regular favorite for high-end collectors, 2016 Panini Immaculate Football delivers the newest rookies and biggest stars of past and present in a premium format. Hobby boxes include five hits that can either be autographs or relics. Limited to just 99 copies, the 2016 Panini Immaculate Football base set includes 100 cards and parallels such as Gold (#/5) and Platinum (1/1). One base card or base parallel falls in every box. Focusing on hard-signed designs and quality memorabilia swatches, the 2016 Panini Immaculate Football hits offer a wide array of choices. Among the many signed cards are Rookie Patch Autographs (#/99), which focus on the biggest 2016 draft names, and also include one-of-one Tag and NFL Shield parallels. In addition to Immaculate Players Collection Autographs, Immaculate Signature Patches, and Premium Patches Autograph, more on-card options include Signature Moves that highlight player celebrations, along with with 100 Immaculate Moments (#/25 or less) and Immaculate Rings. 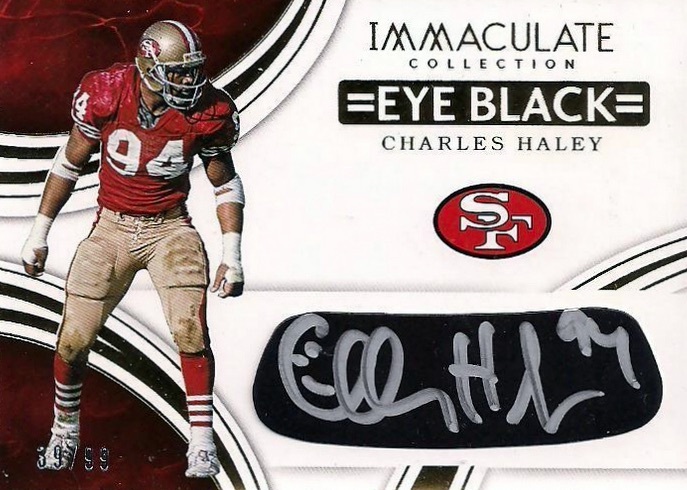 Immaculate Eye Blacks are a new addition for 2016 Panini Immaculate Football that display a signed eye-black piece for top players. The Gold Ink version is a one-of-one parallel. Multi-signed cards up the on-card ante with Immaculate Duals and Immaculate Trios Autographs. 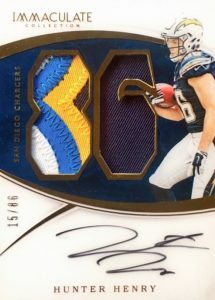 2016 Panini Immaculate Football also boasts plenty of relics to chase, including Jersey Numbers, Laundry Tags, Rookie Soles, and Team Logos. Dual NFL Shields pair logo patches for a retired player and 2016 rookie. PARALLEL CARDS: Gold #/25, NFL Shield 1/1, Platinum Tag 1/1 (*No card #15). PARALLEL CARDS: Gold #/25, Platinum 1/1 (*No card #156). PARALLEL CARDS: Prime Gold #/10 or less, Prime Platinum #/2 or 1/1, Tags 1/1 Prime. PARALLEL CARDS: Prime Gold #/10 or less, Prime Platinum #/5 or less, Tag 1/1. PARALLEL CARDS: Prime Gold #/8 or less, Prime Platinum #/4 or less, Tag 1/1 (*No card #9). PARALLEL CARDS: Gold #/10 or less. 36 cards. Serial Numbered #/15. *Cards found only in parallels noted below. PARALLEL CARDS: NFL Shields #/5, Vapor Jet #/5, Team Logos #/3 or #/2, Nike Swoosh #/2. PARALLEL CARDS: Prime Gold #/5 or #/2 (*Card #38 - #/3), Prime Platinum #/2 or 1/1, Tag 1/1. PARALLEL CARDS: Gold #/25 or less, Platinum 1/1, Tags 1/1. PARALLEL CARDS: Prime #/10 or less (*No cards #25, 57), Brand Logo #/2 or 1/1. 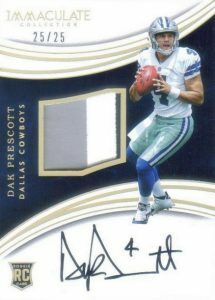 PARALLEL CARDS: Gold #/25 or less, Platinum 1/1, NFL Shield 1/1 (*No rookie card #24). PARALLEL CARDS: Prime #/10 or #/5, Pro Bowl Logo #/2, Brand Logo 1/1. 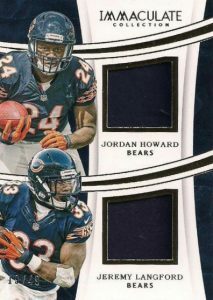 PARALLEL CARDS: NFL Shields 1/1. 30 cards. Serial Numbered #/15. 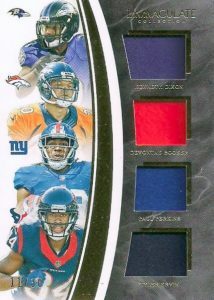 PARALLEL CARDS: New Era/Team Logo #/4, Tags #/3, Shield/Conference 1/1. 34 cards. Serial Numbered #/3. *Cards found only in parallels noted below. PARALLEL CARDS: Shoe Laces 1/1. 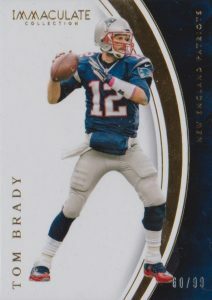 Why do Panini’s high end releases all look the same, especially with all that white on the card? 5 Stars allll the way. This product consistently delivers classiness that never disappoints!! There are too many no-name players in this set for it to be worthwhile. The patches and autos are quite nice, but that all goes out the window when they are players who are not even on the starting roster like Leonte Carroo, Christian Hackenburg, and Ricardo Louis. There are some nice players and legends in the checklist, but the chances of getting them are next to none, unless you are willing to spend hundreds of dollars for a hobby box that only contains SIX CARDS. The designs are also quite lazy. I’d advise collectors (who aren’t millionaires) to avoid this lousy Panini product. 2016 panini Immaculate football Hobby Box Factory Sealed. 2016 Immaculate Factory Sealed Football Hobby Box Carson Wenrz AUTO RC ? ?